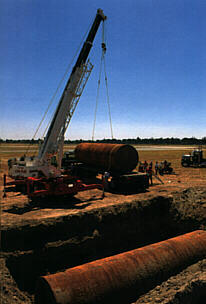 RAMCON is a full-service engineering and environmental contracting company specializing in tank removal, tank installation, site remediation and construction. We have the experience, equipment and manpower to handle the whole job, start to finish. We're fast and competitive. And we know how to work with federal, state and local agencies to expedite your project. Since 1980, Ramcon has worked with environmental consulting firms, oil companies, real estate brokers, developers and private individuals. Today most new projects are referrals - a testimony to our track record of successful projects and satisfied clients. There's no need to hire one company to remove underground tanks, another to remediate the site, and another to construct new facilities. Ramcon does it all. And we do the job right, on time, and within budget. We also take care of permits, testing and regulatory approval. One-source contracting saves you time and money. We own our equipment and transportation, so we can schedule and finish critical jobs on accelerated timelines. Our field personnel have the training and practical experience to do the job quickly and properly - even when unexpected situations come on site. Our project managers guide you job through regulatory approval, ensuring timely project completion. Ramcon is fully licensed and insured. We hold a California "Class A" general engineering license #510034. We also hold the certification of "Haz" for hazardous material removal and remedial action.